The new Scale Air Wolf helicopter, fabricated with glass fiber and processed by spray-painting, has stunning colors and high glossiness. This new Scale Air Wolf is equipped with a high performance brushless motor , brushless speed controller, a high capacity 11.1V 1800mah 20C Li-Po battery, and a durable fiberglass scale fuselage. The Scale Fuselage requires user to fit together. Included Fiberglass Fuselage DOES NOT come assembled. Helicopter Frame is 100% Built-Ready-to-Fly. 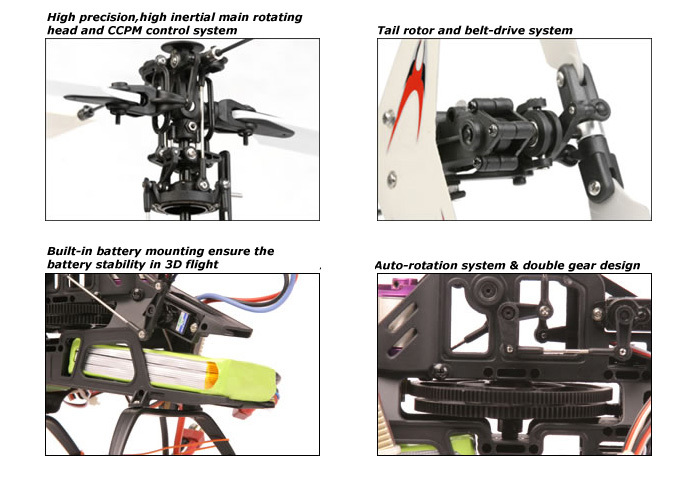 Using the tough plastic materials, the Helicopter does have very strong structure. In addition, the main rotor blades are using top quality wood materials, which is extremely light and not easily break.